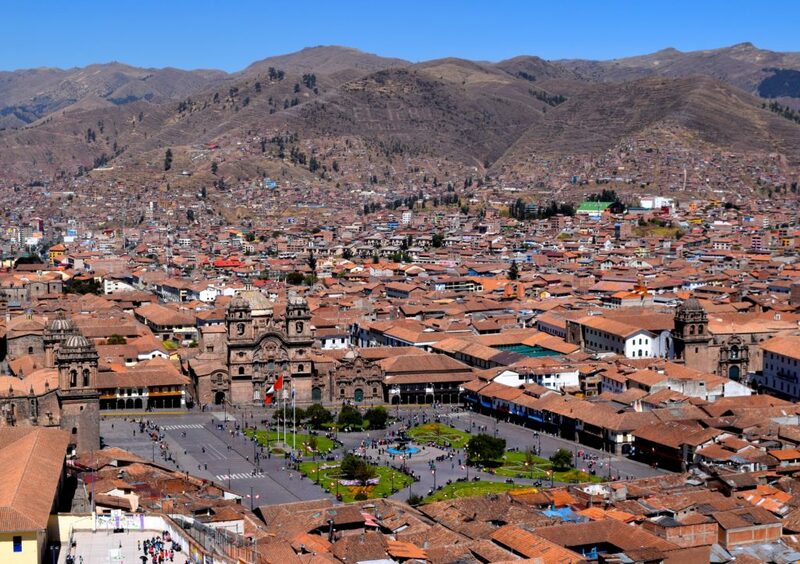 Cusco is surrounded by hills, and from the city center you can see how the houses are climbing up the mountains around you. 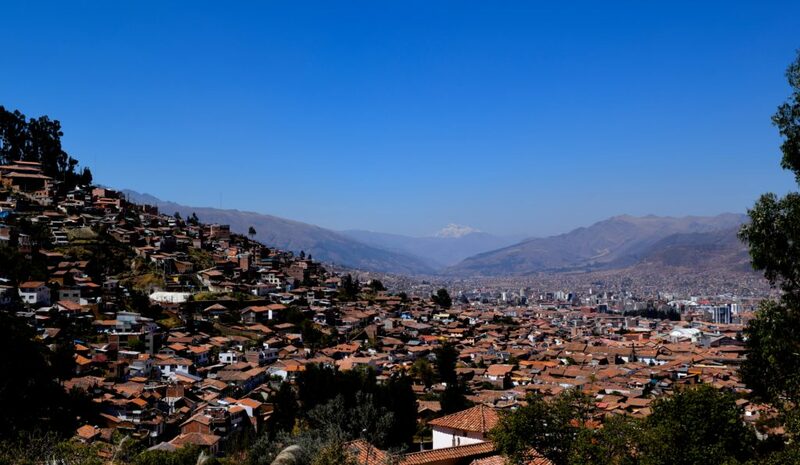 It is quite impressive and it reminded me a bit about La Paz in Bolivia. Anyway – many hills equals great view spots, right? 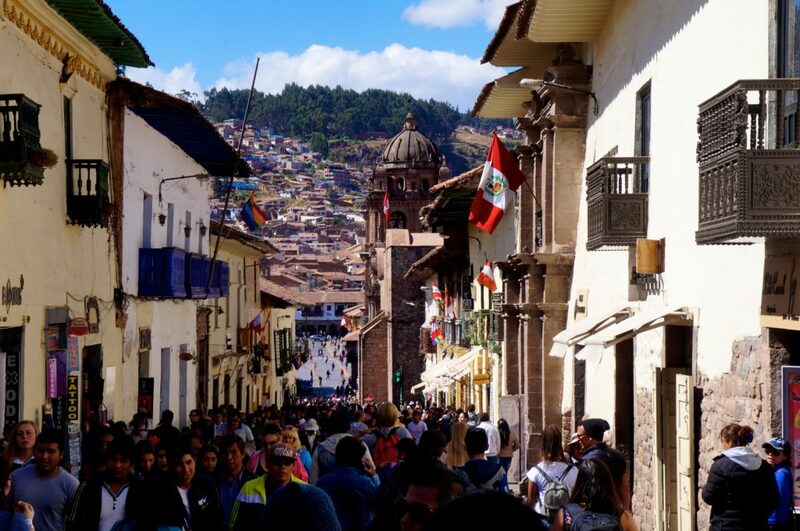 There are so many beautiful view spots in Cusco, and you can even find some nice spots just walking up the streets behind the main plaza. My favorite view spot was at San Cristobal Church, both from the plaza outside the church and from the bell tower. Alpaca clothing is much cheaper in Peru than back home, and you can find a lot of nice and comfy clothes in Cusco! You can either shop at the more decent (and expensive) stores where you know that you will get 100% of high quality alpaca wool, or shop while enjoying the craziness of the markets. 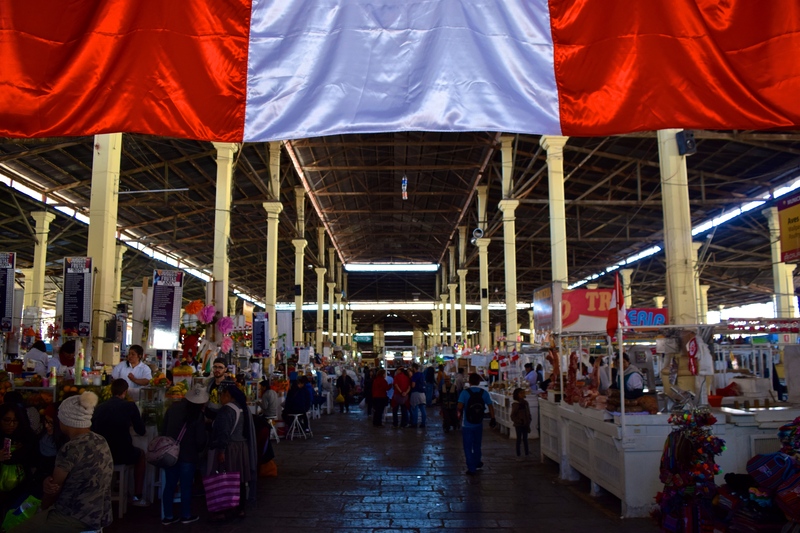 The stalls at the markets don’t necessarily sell 100% alpaca products, but they have loads of nice stuff anyway and personally I’m very happy with the products I bought here. Remember that it’s important to bargain – we ended up getting some products down to one third of the quoted price. The stalls selling alpaca clothing can be found all over the city, both at the bigger markets and along the streets. 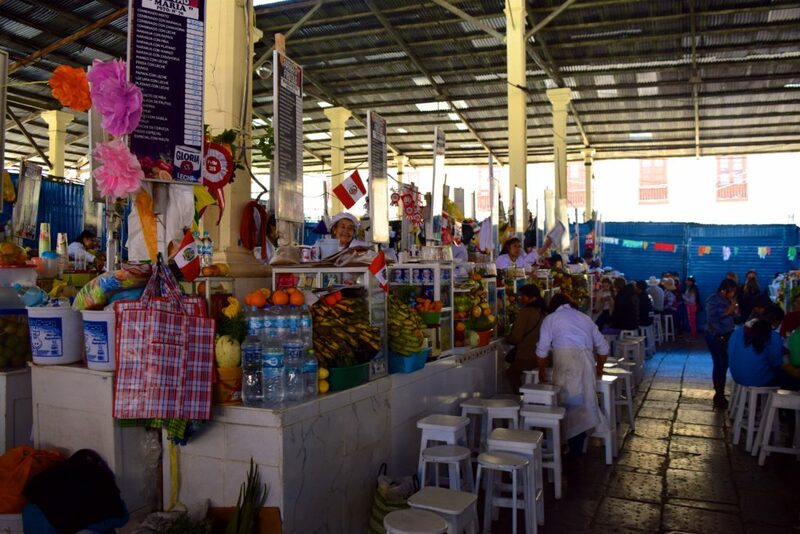 Peru has a rich food culture and you will find a delicious (and interesting) food in Cusco. Have you ever considered eating a Guinea Pig? 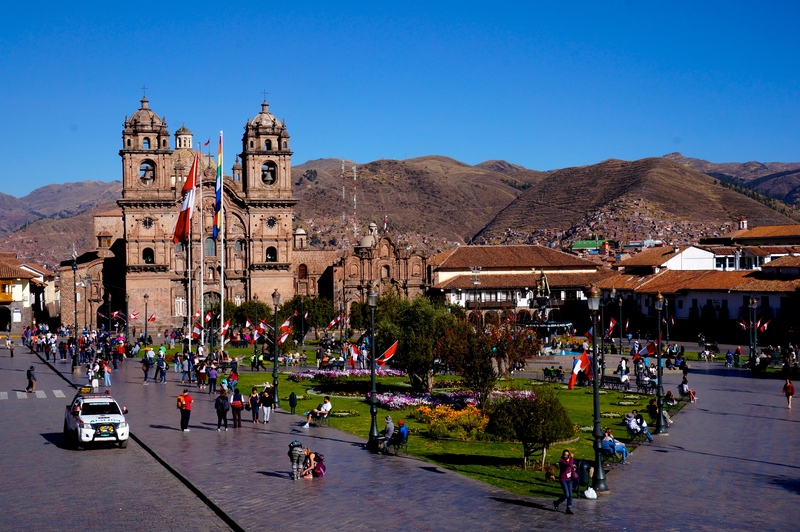 Neither had I – until I came to Cusco. Back home, it’s a popular pet, while in Peru it’s a delicacy called cuy. Of course I had to try it, and it was surprisingly good. Not the best meat I’ve had, but a very fun experience. Another speciality is the alpaca meat, which is delicious. Somehow I managed to eat alpaca meat three times during my short stay in Cusco because it was so tasty! A third local dish that you have to try is the ceviche. The ceviche is raw fish (in cusco; river trout) in dices with some veggies and a sour sauce. It can be found in other countries in the region, but I had the best ceviche ever in Cusco. 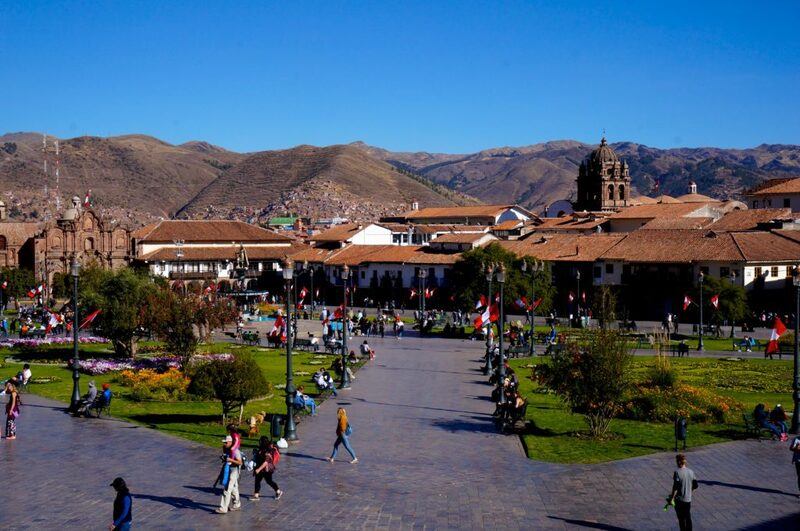 The main plaza, Plaza de Armas, is the heart of Cusco. Both locals and travelers sit on the benches in the park, street dogs run around, small groups of people may demonstrate against political issues and performers are showing their art. 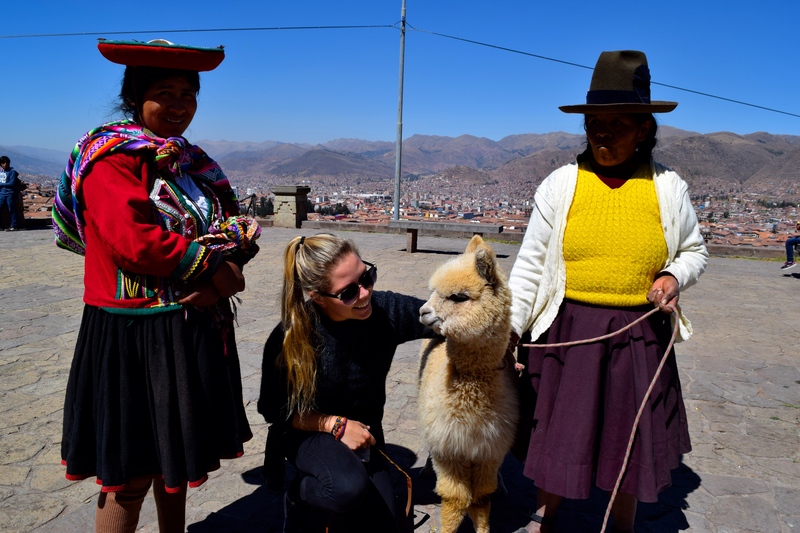 Some women may dress up traditionally and bring their lamas or alpacas so tourists can take a picture with them for a few coins. Tour operators are trying way to hard to sell you a day trip to somewhere closeby, and waiters are trying to convince you to eat at their restaurant. It’s all a big chaos, but it’s also the perfect place for people watching. Wander around and enjoy the stunning buildings all around the town. I don’t think I’ve been to a city with as many churches as Cusco before – it seemed like there was a new church on every corner. Iglesia de la Compania de Jesus is maybe the biggest attraction, as it is located in the middle of the main plaza. Cathedral of Santo Domingo is another impressive church worth a visit. At San Pedro market, you can find everything. 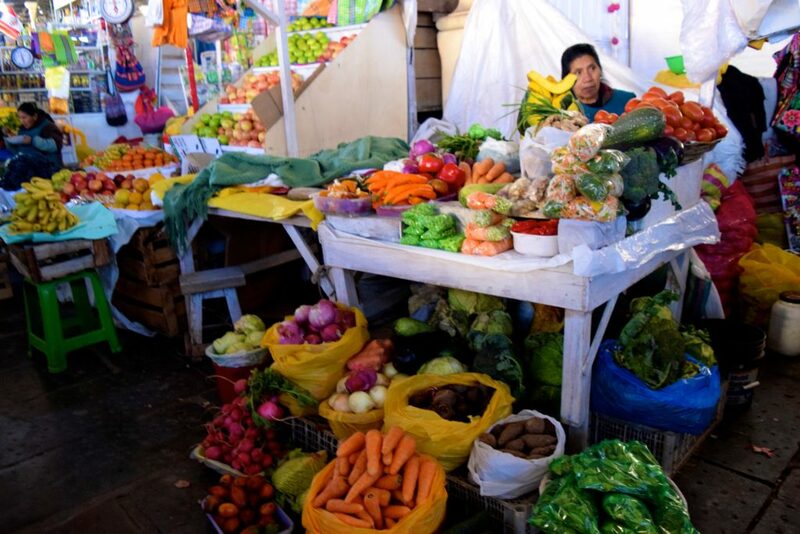 Souvenirs, alpaca clothing, pig heads, veggies and everything else you can think of! The market is not only a place to go shopping; it’s also an attraction itself. And don’t forget to try the fresh juices, they are delicious and super cheap! 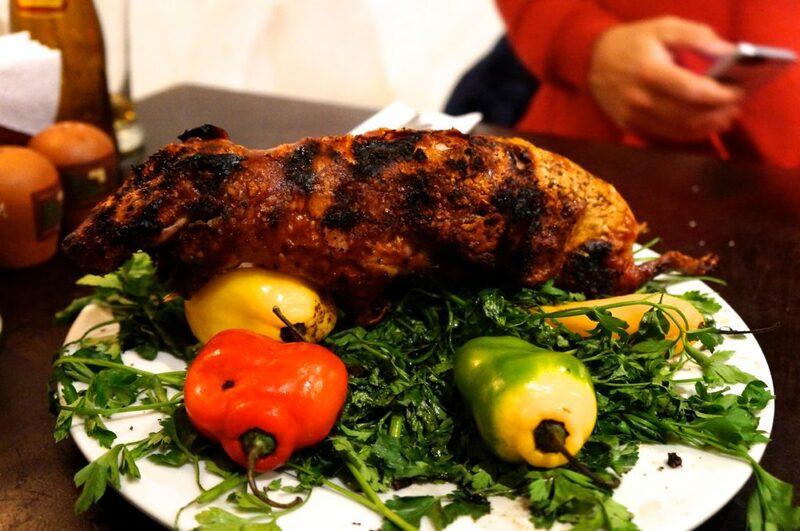 – Urchu Peruvian Steakhouse: Amazing meat! I had a platter with alpaca, lamb and steak, which was really good. Served with a fresh avocado salad and your choice of potatoes, this was the best meal I had in Peru. -Pachapapa: Famous for their Guinea Pig, we had to go here to try it. It was surprisingly good! A must to try when in Cusco. -Barrio Ceviche Seafood Kitchen: The best ceviche I’ve ever had! -Cafe del Museo: The place to go for coffee lovers and a good spot for breakfast, brunch or lunch. We stayed at Esplendor Hotel Cusco, which I highly recommend. Not the cheapest hotel in town, but nothing is better than a nice, clean hotel room after hiking for four days! The service was excellent and the location was good. This entry was posted in Peru, South America and tagged Backpacking, cusco, Peru, SouthAmerica by Maria's Adventure. Bookmark the permalink.